This item will be sent through USPS, UPS, FedEx, Lasership, etc. Delivery times about 3-5 business days. 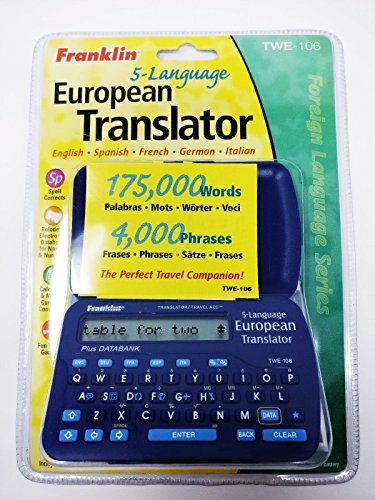 With the Franklin European Translator, you'll never again be at a loss for words! Its 16-character display will give you more than 175,000 words and 4,000 conversational phrases. And it's about the size of a passport. The conversational phrases are grouped in categories such as Business, Travel & Directions, Shopping, Hotel, and Emergencies. It even corrects misspelled words in all languages before you translate. Other features include a calculator with a metric/currency converter, a phone list with major U.S. and European airline and embassy numbers, and two word games. If you have any questions about this product by FR, contact us by completing and submitting the form below. If you are looking for a specif part number, please include it with your message.